Visit our preschool facility today. Tell other parents about us. Know our latest activities and program today. Welcome to Kiddy Land Pre-School Inc.
Kiddy Land Pre-School Inc. has been providing Quality Care in the community of Pompano Beach, Florida, for over twenty years. Our facility has 24-hour monitoring, individual classrooms and three playground areas. We afford a pick-up and drop off service (additional fee) from and to home. Kiddy Land Pre-School Inc. focuses on the individual student cognitive, gross and fine motor, social, emotional, and physical development skills. Our students learn grace and courtesy, respect for other, self-respect, respect towards the environment, in this we ask for full parental support. Enroll today! We are currently accepting application for all age groups. Rates are affordable and we also work with Family Central. 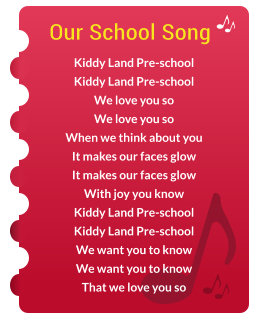 Kiddy Land Pre-School Inc. has a mission to provide quality care to our students, through daily nurturing and guides during the tender years of childhood our goal is to shape them by showing positive role modeling, peers and experiences at Kiddy Land Pre-School Inc.. "